Paisley town centre will once again be at the centre of a scooter spectacular when the ever-popular ModStuff event returns to the annual Spree festival. The annual festival-within-a-festival – run by LNP Promotions – celebrates all things Mod and Northern Soul, and will again take over the Spiegeltent in County Square on Saturday 20 October. As well as all-day musical entertainment, the event will see around 70 scooters gather in County Square in the afternoon before riding out and around the town. This year ModStuff will be sponsored by local bar Burger and Keg – based around the corner in Gilmour Street – who will be hosting three DJ nights from Friday 19 to Sunday 21, including the official ModStuff aftershow party on the Saturday. 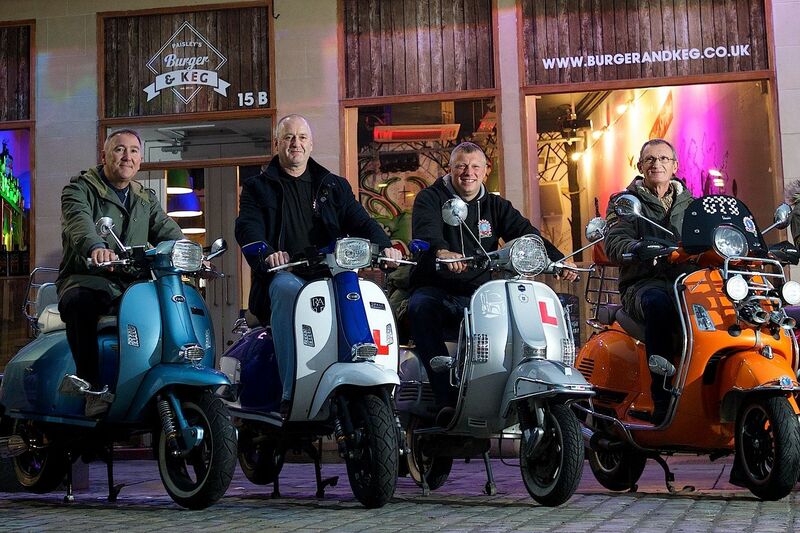 This year’s scooter rideout – run in partnership with Paisley Vespa Club – will be raising funds for Renfrewshire Carers Centre, with Burger&Keg sponsoring competitions for the best scooters, including furthest-travelled and best-dressed. ModStuff sees two Spiegeltent shows on the Saturday – a free afternoon one (12 to 5pm) featuring Lemon Soul, START! and Dexy’s Tribute Band, and a now-sold-out evening show with Absolute Jam, Les BOF! and The Signatures. The Spree festival is run by Renfrewshire Council and is now in its seventh year. Acts appearing this year include Martha Reeves & The Vandellas, London African Gospel Choir, Black Sabbath’s Tony Iommi, The Orb, Gang of Four, Wolfgang Flür (ex Kraftwerk), Big Minds, The Wandering Hearts, Tracyanne & Danny, The Pastels, Vieux Farka Touré, The Leisure Society, Duke Special, Aidan Moffat & RM Hubbert, Gillebrìde MacMillan, Des Clarke, Janey Goldey and Stuart Mitchell. Gary Kerr of LNP Promotions said: “We are delighted to be bringing ModStuff back to The Spree once again – the event grows in popularity every year. “The evening show sold out weeks ago but we would encourage people to come down for the afternoon and enjoy the free show and the spectacle of the scooter rideout. “People will be travelling from across Scotland to take part and we are delighted to be raising funds for a great cause in Renfrewshire Carers Centre. We’d also like to thank Burger and Keg for their support. Trevor Mills, owner of Burger and Keg, added: “ModStuff weekend is one of the highlights in the Paisley calendar and we are excited to be working alongside LNP, who have done a fantastic job growing this event with the help of the very supportive and thriving Mod scene. Details of full programmes and ticket information for The Spree, The Wee Spree and the Spree for All are available at www.thespree.co.uk or from the festival box office at 9b Gilmour Street, Paisley PA1 1DG.